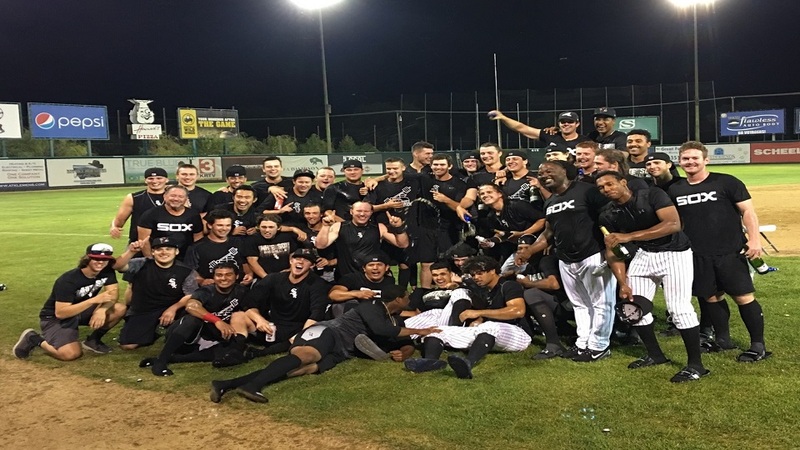 Great Falls, MT-The Voyagers erased an early two-run deficit and scored eight times over four consecutive innings on their way to capturing a two-game sweep of Billings with a 9-2 victory Saturday night at Centene Stadium. Great Falls (2-0) will play in the Pioneer League Championship Series for a second straight season. The Voyagers fell to Ogden in the title round last year, and last won a league title back in 2011. Billings (0-2) was swept after posting the league's best record in the second-half of the season. The Mustangs jumped in front early with a two-run top of the second. Dylan Harris hit a one-out, solo home run to left for the game's first run. After Reniel Ozuna followed the homer with a double off the wall in right-center, Miguel Hernandez singled to right for a 2-0 lead. The Voyagers quickly replied with two to tie it in the home half of the second. Bryce Bush led off the inning with a single to left. Amado Nunez brought Bush home with a double to the gap in right-center. Nunez later scored the tying run on a wild pitch. Great Falls took the lead with two in the third. Lenyn Sosa led off the frame with a single to center. With one out, Bryce Bush smacked an RBI double to the wall in right-center. Amado Nunez plated Bush with an RBI single to center that made it 4-2. The Voyagers then seized control of the game as eight men came to the plate for a three-run fourth. Ryan Fitzpatrick and Gunnar Troutwine started the inning with line drive singles. Micah Coffey brought both runners home with a line drive double to left. Lenyn Sosa made it 7-2 on an RBI single to left. After leading off the fifth with a base hit to center, Bryan Connell later scored on a wild pitch for an 8-2 lead. The final run came on a solo home run for Amado Nunez leading off the bottom of the seventh. Three Voyager relievers combined to retire 18 consecutive batters over the final six innings. Davis Martin picked up the win in relief. Martin (1-0) went four scoreless with two strikeouts. Ricky Salinas took the loss in his start for the Mustangs. Salinas (0-1) lasted just two-and-a-third and surrendered four earned runs on six hits with two strikeouts and one walk. Devon Perez and Johan Dominguez each worked one inning for Great Falls. Great Falls outhit Billings 12-to-4. Amado Nunez went 3-for-4 and was a triple shy of the cycle. Nunez drove in three and scored twice. Lenyn Sosa and Bryce Bush each posted two hits. Bush had one RBI with two runs. Great Falls awaits the winner of the Pioneer League South Division Series. A decisive game three between Grand Junction and Ogden is scheduled for 5 p.m. Sunday at Suplizio Field in Colorado. 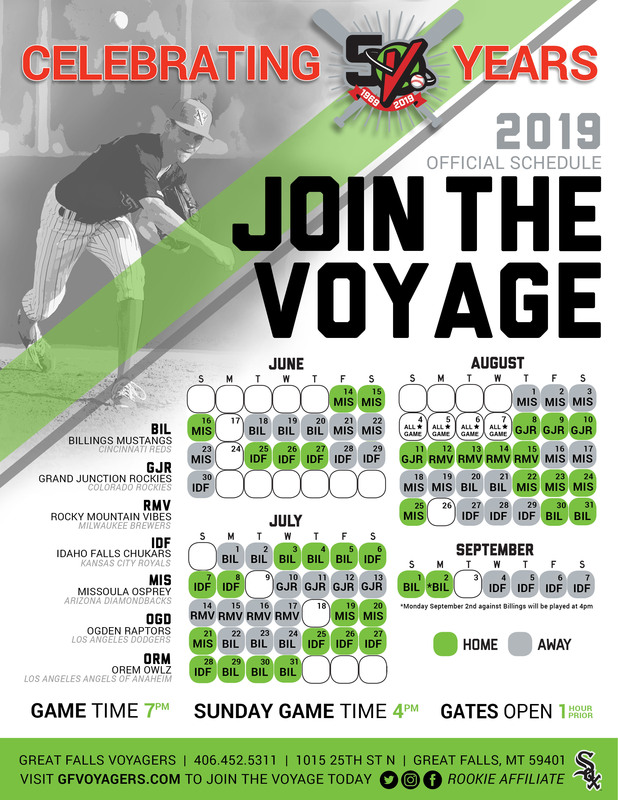 For 2018 playoff tickets and promotional information, call 406-452-5311 or visit www.gfvoyagers.com.